Download our cylinder manufacturing catalogue here. 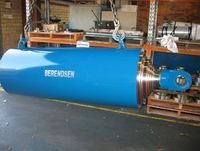 Berendsen Fluid Power manufactures a range of customised telescopic cylinders. Our specially designed and built Telescopic Cylinders are the first choice for a well engineered and manufactured cylinder for diverse mobile and industrial applications. Designed with the aid of computer generated calculations and drawings, the cylinders are made in our dedicated manufacturing facility in Newcastle. All of our Telescopic Cylinders are designed concerning the application and the user’s specification and fully conform to the standard upon request.